The quality he was describing appears to be the ability to put aside personal assumptions and intellectual needs and to let a character or situation speak for itself. This capability was ‘negative’ in the sense that it meant withdrawing oneself from the situation. It required openness to what is, to what is given, and the willingness to be comfortable with that, without the need to explain or justify. But the nightingale becomes a symbol of what is beyond his own struggling. The bird’s beautiful, timeless singing helps him for a moment to leave his own aching, to take himself out of the picture in a way that ‘hemlock’, ‘ a draught of vintage’, ‘the viewless wings of Poesy’ and even death itself cannot achieve. The nightingale brings him a peace because it represents the truth that is beyond life’s ‘mysteries, doubts, without any irritable reaching after fact and reason’. Which fits best with our experience? 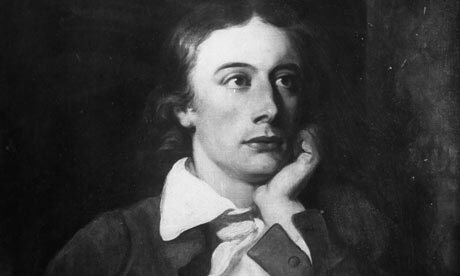 Keats ‘negative capability’ – that it is possible to put aside our own fears and doubts and believe in the possibilities and truths that emerge from an openness to what life brings. Or this poem – that however hard we try to do that, we’ll return in the end to the harsh realities of our lives. Or can it be both? My heart aches, and a drowsy numbness pains My sense, as though of hemlock I had drunk, Or emptied some dull opiate to the drains One minute past, and Lethe-wards had sunk: ‘Tis not through envy of thy happy lot, But being too happy in thine happiness,– That thou, light-winged Dryad of the trees In some melodious plot Of beechen green, and shadows numberless, Singest of summer in full-throated ease. Fade far away, dissolve, and quite forget What thou among the leaves hast never known, The weariness, the fever, and the fret Here, where men sit and hear each other groan; Where palsy shakes a few, sad, last gray hairs, Where youth grows pale, and spectre-thin, and dies; Where but to think is to be full of sorrow And leaden-eyed despairs, Where Beauty cannot keep her lustrous eyes, Or new Love pine at them beyond to-morrow. Away! away! for I will fly to thee, Not charioted by Bacchus and his pards, But on the viewless wings of Poesy, Though the dull brain perplexes and retards: Already with thee! tender is the night, And haply the Queen-Moon is on her throne, Cluster’d around by all her starry Fays; But here there is no light, Save what from heaven is with the breezes blown Through verdurous glooms and winding mossy ways. I cannot see what flowers are at my feet, Nor what soft incense hangs upon the boughs, But, in embalmed darkness, guess each sweet Wherewith the seasonable month endows The grass, the thicket, and the fruit-tree wild; White hawthorn, and the pastoral eglantine; Fast fading violets cover’d up in leaves; And mid-May’s eldest child, The coming musk-rose, full of dewy wine, The murmurous haunt of flies on summer eves. Darkling I listen; and, for many a time I have been half in love with easeful Death, Call’d him soft names in many a mused rhyme, To take into the air my quiet breath; Now more than ever seems it rich to die, To cease upon the midnight with no pain, While thou art pouring forth thy soul abroad In such an ecstasy! Still wouldst thou sing, and I have ears in vain– To thy high requiem become a sod. Forlorn! the very word is like a bell To toll me back from thee to my sole self! Adieu! the fancy cannot cheat so well As she is fam’d to do, deceiving elf. Adieu! adieu! thy plaintive anthem fades Past the near meadows, over the still stream, Up the hill-side; and now ’tis buried deep In the next valley-glades: Was it a vision, or a waking dream? Fled is that music:–Do I wake or sleep?